Hashtags on Facebook: What’s the Scoop? Why, oh dear Lord, why? Personally I’m in the last category, but I will go through each category here. First of all because I’d like to give people who don’t know what hashtags are, or how they can be used, an introduction. But I also would like to go through the pros and cons of the use of hashtags. What now?If you don’t know what hashtags are, here is a short intro: Hashtags are keywords that are used to categorise something you’ve posted. It’s heavily used on social sites like Twitter and Instagram, and to a lesser extent on Google+ and LinkedIn. You create a hashtag simply by putting the #-character in front of a word or phrase. The phrase can’t have any spaces in it. So if you for instance posted a photo of your breakfast on Instagram, an all too frequent occurrence I’m afraid, you could tag this post with the phrases #breakfast #food #morning or something similar. These hashtags will then become links. If people click on any of them, Instagram will do a search for you and present other photos tagged with the same hashtag. During big world wide or national events, people tend to agree on specific tags for the event. So during the Eurovision Song Contest people who posted on Twitter about it used the hasthtag #esc. When a hashtag becomes very popular, it turns into a trending topic, and Twitter often display trending topics for you via the hashtag. So is this useful for you? Yes, it makes it much easier to know what to search for and to find postings about subjects you care about. In addition it makes it easier for others to find your own postings. Now, this could make it very tempting to pepper your postings with hashtags, but please don’t. I’m guilty of doing this myself, but if you use too many hashtags, people or services might consider it as spamming. 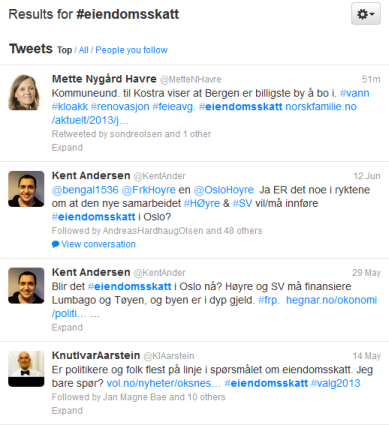 In the image above, I’ve searched for the hashtag #eiendomsskatt (property tax) on Twitter. I could easily have done this on also Instagram, Google+ or LinkedIn. And now you can do it on Facebook. I was a bit surprised to see that people who are using social media sites a lot were completely against hashtags on Facebook. However, I think I know where they are coming from. Hashtags, especially on Twitter, can sometimes be used in a very bad way. Very often you will find people using a hashtag they have invented, like #mymommaisagreatcook. Naturally, these hashtags don’t lead to any other topics about this, and are therefore just meant to be funny or clever. There are also safety issues. Remember that hashtags are meant for searching and sorting topics. So if you tag a posting on Facebook, will this posting then be visible for everybody who do a search on that tag? Or will is just be visible to you and your friends? A friend of mine tagged his posting with #molde, which is the name of the town where we live, and I clicked on it. I got a long list of postings tagged with #molde, and I only knew a few of the people who had done these postings. Now, does Facebook also list postings from accounts that are protected from anyone but friends? I don’t know. I choose to think they don’t, but you never know. On top of this, a lot of people don’t know what their security settings are, so if you start using hashtags, please make sure that you’re settings are set to a level that you feel comfortable with. I’m afraid we are going to see a lot more examples of people finding postings they thought were only presented to a closed circle out in the open. Now to my group. I love hashtags! I’ve used them, and I’ve abused them. I frequently do searches via hashtags on most services I’m on. Even on LinkedIn. Just take this blog for example, the tags for my postings here can be thought of as hashtags. Just click on one of them in any of my postings here, and give it a try. Even flickr has had tags since the beginning. They’re not hastags, but the principle is the same. I’ve therefore often wondered why Facebook haven’t introduced hashtags, since they for years were leading the way for social media. They have fallen a bit behind in recent times, but hashtags are a welcome addition now that they’re finally here. So, please use hashtags. But use them wisely. Use them so that people easier can find your postings and use them to generate traffic based on how interesting and relevant you can make the tags. But do not use 10-20 tags in a posting. Let’s make a deal. From now on, I will from now on only use three hastags for every posting I do, and you will do the same. Deal?